The iPad offers great benefits because of it’s form factor and mobility. The Retina display allows relaxed working over a long time. It’s a complete device without the need of any peripherals. So it’s predestined for many tasks where a powerful processor, a perfect display and a reliable operating system is required. Business or other meetings today are a bit different from old-fashioned lectures at universities decades ago or solo actions of Monday-morning quarterbacks. Let’s talk about some aspects where the iPad may improve the results of meetings and enforce the participation of the meeting members. The technical equipment is geared towards extensive communication between the members and supports presentation of ideas on an ad-hoc basis. Additional support for information exchange between iOS devices of the meeting members is provided by a new app named INSTASHARE, which supports direct file transfer between iOS devices Macs and PCs (Beta). For explaining and clarifying propositions and opinions each iOS device can be connected to a Beamer or a TV to show secondary sources, ideas, doodles and stickies. So a highly flexible environment is established for growing Big Onions with relatively less financial and technical efforts. People will use the tools that are most familiar and easy to use to find acceptable results. For example, one might consult a generalist co-worker down the hall rather than a specialist in another building, so long as the generalist’s answers were within the threshold of acceptability. The iPad provides this approach (via Internet, company servers, cloud storages, locally saved documents) to all the information which might be relevant to achieve the best results even if the present knowledge of the audience is insufficient to clear up some details. 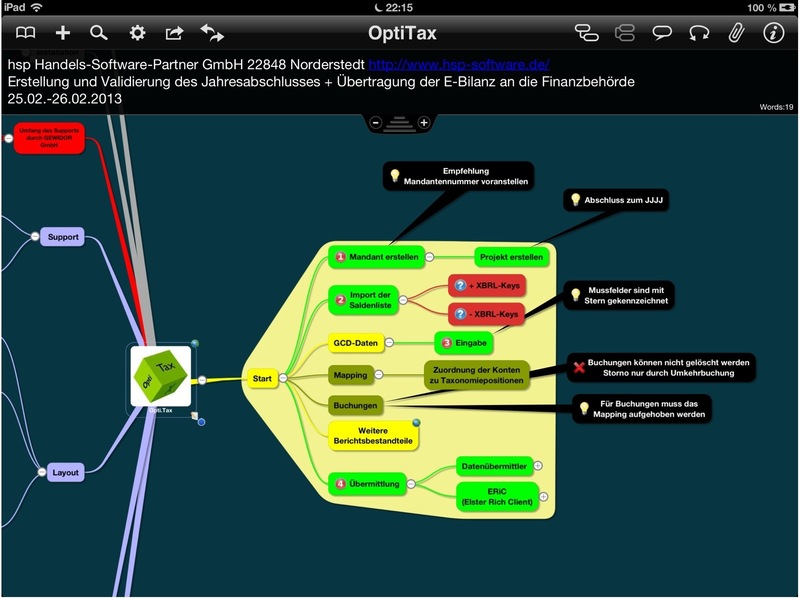 This mind map (Opti.Tax) was created during a meeting about the usage of a software product which supports the upload of balance sheets to the tax authorities. This procedure is required by law in Germany beginning with the accounting year 2014. One training participant documented the lecture with the help of a mind map shown below. Others created questions and hints with Apple’s iWork app PAGES regarding the usage of the software product as well as suggestions for feature updates. 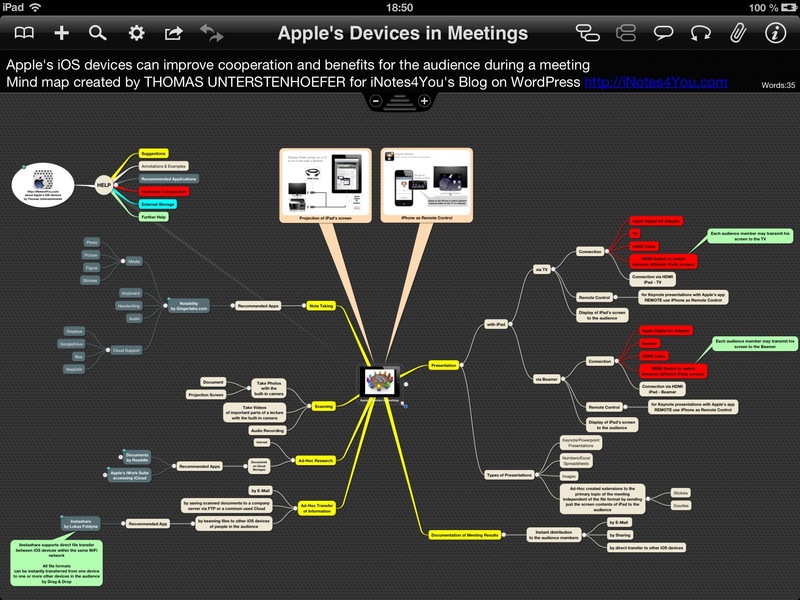 The documents have been transferred to the iPad and added the mind map’s branches. Transfer was done with Instashare (see the brief description below). Exchanging files of any type between meeting members can be done with a new app, released in February 2013, available at Apple’s App Store. Instashare is an aptly named utility that lets you instantly share files between iOS devices, Macs, and Windows PCs (Beta). Sharing is quite simple. Once you’ve connected Instashare on your iDevice with another iOS device or a Mac companion app. On the iOS device all connectable devices appear on the right side and the file list on the left side. You then transfer files by Drag and Drop from left to right. Instashare uses a WiFi or even a Bluetooth connection. 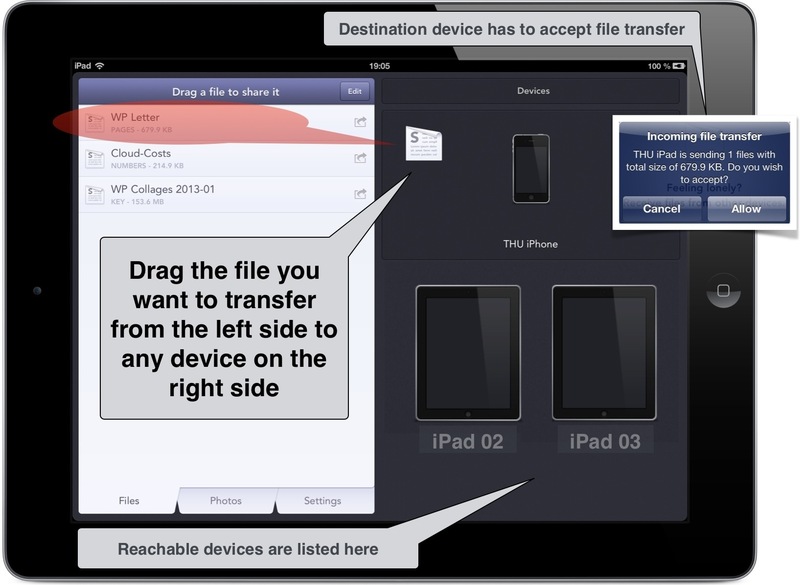 In addition, you can transfer files of any file type from a Mac to your iOS device and vice versa. Files received by a Mac appear in the Downloads folder, while those received by an iOS device can be found in Instashare’s local app folder. You may also try the app Anywhere Pad. Once you create a meeting and add a blank whiteboard page meeting members can add sticky notes and freehand drawings. I have no experiences with this app, so I cannot rate it. At the time I wrote this article there were no user ratings at the App Store.